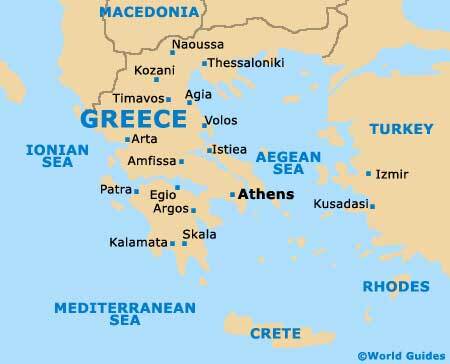 Greece is a country located in south-east Europe located between the Mediterranean and Aegean Seas and Greece includes many islands such as Rhodes, Crete, Corfu and the Dodecanese Islands. There is a wealth of accommodation in Greece to suit all travellers including budget lodging, travel lodges, bed and breakfast and luxury hotels. Places to visit in Greece are endless and there is something to suit everyone with a wealth of historic sites, sporting venues, walking trails, museums, landmarks, monuments, festivals, carnivals and quality shopping. Greece has a long and rich history and offers a wealth of attractions and places of interest to visit. Athens, the capital city of Greece, is an ancient city, steeped in history, with numerous places of interest including the magnificent Acropolis. Other places to visit include Rhodes, Crete, Ionian Islands, Meteora, Peloponnese, Sporades, Thessaloniki, Piraeus and much more. Athens, the capital city of Greece, is an ancient city, steeped in many centuries of history. The city has an enormous amount to offer both tourists and business travellers alike, including many spectacular monuments. Filled with Greek history and steeped in Minoan mythology, the island of Crete is surprisingly large and the biggest of its kind in Greece. Crete is home to Byzantine monasteries, Venetian castles, palace remains and plenty of beaches. Also often referred to as 'Kerkyra', the Greek island of Corfu is the second-largest of the Ionian Islands. Corfu lies on the westerly side of mainland Greece and has countless secluded beaches, olive groves and vineyards. The biggest of the Ionian Islands, Kefalonia is nothing short of an exceptional Greek holiday destination. With rugged mountains, awesome sandy beaches, beautiful harbours and cliff-top views, Kefalonia is always popular in the summer. One of the Greek Dodecanese Islands, Kos is almost overflowing with beachfront resorts and traditional tavernas, together with some interesting archaeological sites. Kos Town serves as the island's capital and is well worth exploring. A glamorous Greek island and part of the Cyclades archipelago, Mykonos contains a wealth of stunning beaches and exciting nightspots. The capital of Mykonos Town (Hora) is very much central to the tourism scene on the island. Naxos is an alluring island with a distinctive classical Greek character. Naxian wine is a particular speciality of the island, while sweeping beaches, friendly mountain villages and ancient remains are never far from hand. A leading Greek port which is one of the largest in the Mediterranean, Piraeus (Pireas) is a very prominent city and considered by many to be an outlying suburb of Athens. Tourism in Piraeus is at its best around the Mikrolimano Harbour. Rhodes is the biggest of the Dodecanese Islands and offers tourists an average of more than 300 sunny days every single year. The beaches of Rhodes are nothing short of dreamy and the nightlife is cultured, exciting and very tempting. The island of Santorini has been rather shaped by its volcanic history and the water-filled 'caldera' crater is a strong reminder of this past activity. Santorini's colourful cliffs are very distinctive and often crammed with traditional stone houses. Situated within northern Greece (Central Macedonia), Thessaloniki is second only to Athens in terms of overall size. A city of culture and indulgence, Thessaloniki is home to an attractive waterfront, where its famous White Tower is clearly visible.